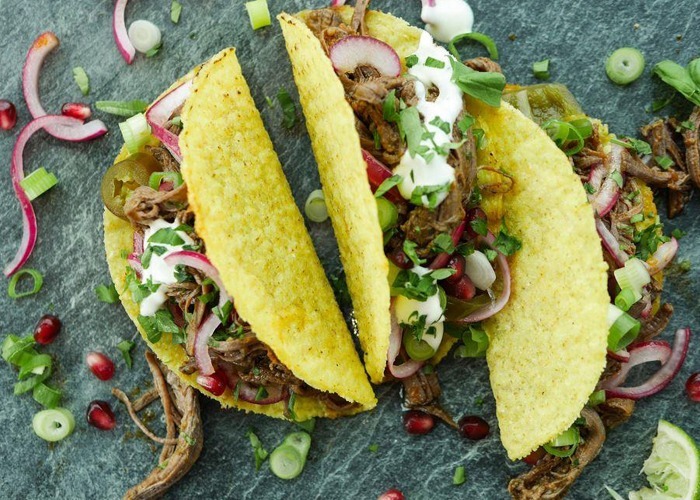 Barbacoa is a Mexican dish of slow cooked, spicy and tangy meat, often shredded and served as tacos. Our recipe uses beef but you can substitute this with pork if you prefer. Place the chipotle paste, coriander, red onion, garlic, cloves, salt, lime juice, and cider vinegar in a food processor and pulse until combined. Add to a removable slow cooker bowl and place the brisket on top of this mixture. Add the stock and the bay leaves. Use tongs to turn the meat a few times in the sauce. Put the lid on the slow cooker. Cook until the meat shreds easily with 2 forks, 8 to 10 hours on Low or around 6 hours on High. Delicious served as tacos with salsa, coriander, sour cream and onions. This recipe is courtesy of Crock-Pot.